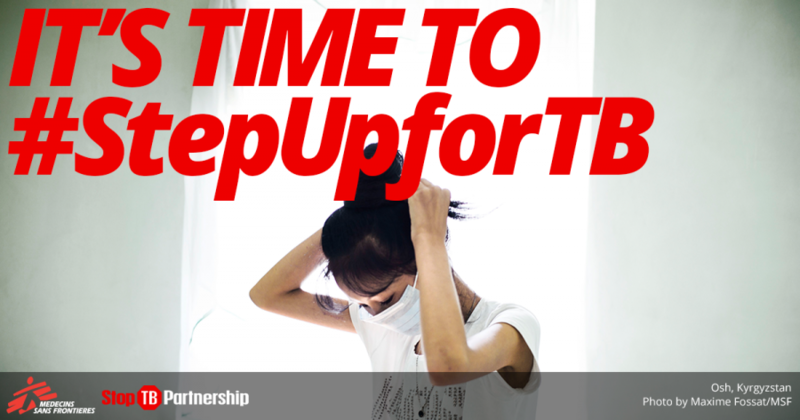 Doctors Without Borders/Médecins Sans Frontières (MSF) is calling on world leaders to #StepUpForTB and to take measures to address tuberculosis as a global health emergency that kills millions of people each year. “How is it possible that more than 60 years ago, we managed to send people to the moon and to the deepest point in the ocean, yet people affected with one of the most ancient diseases in human history continue to suffer and die because we’ve failed to find a fast, safe and simple cure for tuberculois (TB)? All it would take to have a faster, safer, simpler cure for TB is for governments to care enough to make it a political priority. World leaders this week must show some spine and take collective responsibility to fight this global health emergency, so we don’t keep losing one fellow human to TB every 18 seconds.” — Sharonann Lynch, HIV & TB Advisor for MSF’s Access Campaign. Tuberculosis (TB) is one of the most deadly infectious diseases in the world. In 2015, 10.4 million people became ill with TB and 1.8 million people died from the disease, mainly in developing countries. Today, TB is the leading killer infectious disease, followed by malaria and HIV/AIDS. TB is often thought of as a disease of the past, but a recent resurgence and alarming rise in cases of drug-resistant (DR-TB) and multidrug-resistant TB (MDR-TB) make it very much an issue of the present day and age. Drug resistance – when TB does not respond to the customary first-line drugs – can result from inappropriate or incorrect use of antimicrobial drugs, premature treatment interruption and, increasingly, from person-to-person transmission. October 23, 2018 — People with drug-resistant tuberculosis (DR-TB) continue to be deprived of today’s best-possible treatment in part because of high drug prices, according to a new report — DR-TB Drugs Under the Microscope — released today by Doctors Without Borders/Médecins Sans Frontières (MSF) at the 49th Union World Conference on Lung Health in The Hague, the Netherlands. MSF called, in particular, on US pharmaceutical corporation Johnson & Johnson (J&J) to cut the price of the newer TB drug bedaquiline in half, so more lives can be saved. In August 2018, the World Health Organization (WHO) recommended expanding use of bedaquiline (produced by J&J) by making it a core drug for treatment of DR-TB, while at the same time relegating drugs that need to be injected daily— and can cause deafness, renal failures and other severe side effects—to last-resort options only. This change dramatically increases the number of people who should receive bedaquiline, and requires national TB treatment programs to scale it up as part of the DR-TB treatment they provide. Despite the expected benefits, high prices remain a significant barrier. J&J received substantial taxpayer money from the US and other governments for the development of bedaquiline, and therefore has a clear responsibility to make sure the public gets a return on this investment by making the drug affordable for everyone who needs it. To ensure the drug is accessible to all, MSF called on J&J to issue a non-exclusive license to the Medicines Patent Pool to allow for price-lowering competition among generic producers. On September 26, world leaders and delegates attended the United Nations' first-ever High Level Meeting on Tuberculosis. MSF had called for leaders to use the meeting to commit to urgent action in the global fight against the TB epidemic, and had urged Canadian Prime Minister Justin Trudeau to attend. The bad news is that global leaders failed, once again, to make people with TB a priority, further stalling progress in this fight. Out of the 193 UN member states, fewer than 30 leaders chose to attend the meeting today. Leaders missing from this critical meeting include many from high-burden TB countries and donors that have been promising to help fund the fight to ‘end TB.’ Shame on the more than 160 leaders who were absent today. On September 17, the Toronto Star published an op-ed written by MSF Canada Executive Director Joe Belliveau and Humanitarian Affairs Advisor Jason Nickerson calling on Canada to step up and match our government's words with action at the United Nations High-Level Meeting on TB in New York on September 26, 2018. "Now is the time for action. After years of political indifference, the United Nations will host the first-ever High-Level Meeting on Tuberculosis this month: world leaders will gather in New York on Sept. 26 to discuss how they can close the global gap in access to TB prevention, diagnosis and treatment. We are urging Canada to step up and take the lead. Domestically, Canada’s government is already responding, and has pledged to eliminate TB in the country’s Far North by 2030. This is a welcome step forward. But without also addressing the larger global challenge, these efforts alone will not be enough. Here’s why: More than 10 million people around the world contract TB each year. Uncomplicated forms of the disease are treatable, but deadlier and drug-resistant forms of TB are spreading widely." September 18, 2018 — The World Health Organization (WHO) released its annual Global TB Report today, one week before heads of state will convene at the UN High-level Meeting on TB on September 26. The report highlights sluggish global progress on TB, indicating that countries will not be able to meet their targets in the "End TB" strategy at this slow pace. TB remains the world’s leading infectious disease killer, taking 1.6 million lives in 2017 (compared to 1.7 million in 2016), with 10 million people developing TB in 2017 (about 10.4 million people had TB in 2016). Of grave concern are the prevailing gaps in diagnosing and treating people with TB: in 2017, 64% people with TB were diagnosed and their cases reported (compared to 61% in 2016). Among people with drug-resistant TB (DR-TB), 25% of people who were diagnosed were also treated (compared to 22% in 2016). In the Summer 2018 issue of Dispatches, the MSF Canada magazine, Canadian humanitarian affairs advisor Jason Nickerson writes that this country can and should play a unique role in helping to end the global TB epidemic. "In March, Canada’s government, alongside the Inuit Tapiriit Kanatami, announced a commitment to eliminate TB across Inuit Nunangat by 2030 and to reduce the incidence of active TB by at least 50 per cent by 2025. These kinds of specific time-bound targets for eliminating TB are what other countries should be implementing, and Canada can show leadership by pushing its allies to make similar commitments. But achieving these targets will be impossible without the medical tools to get us there. We need countries with productive biomedical research and innovation capabilities, like Canada, to step up for TB and commit to developing the medicines, diagnostics and vaccines that we need to end the pandemic quickly." Tuberculosis is the world’s leading infectious killer. TB kills one person every 18 seconds, yet the disease can be prevented, treated and cured. For the first time ever, world leaders will come together later this year at a special United Nations High-Level Meeting (UNHLM) to discuss TB and the steps needed to tackle this global health emergency. We need countries like Canada to be leaders in making sure that the outcome of the UNHLM is robust and sets measurable targets to close the testing, treatment, and prevention gaps that exist around the world (including in Canada itself). 1. Taking the lead and using Canada's status as a global health leader to close the gap in access to TB diagnosis and treatment, including ensuring that there is sufficient and sustainable financing to end the epidemic. 2. Actively pushing for a global commitment to finance TB research and development (R&D), including a short-course oral cure for TB (and its drug-resistant forms), better TB diagnostics that are affordable, specific, and sensitive, and novel vaccines to prevent infection or disease by 2030. 3. Pushing for countries to commit to national and global targets for testing, treatment and prevention of TB that are time-bound, ambitious and measurable. 4. Pushing to ensure that the UNHLM results in an accountability and review mechanism that defines clear, country-specific deliverables. The HLM should reconvene in 2023 and regularly thereafter to assess country progress toward the agreed upon outcomes. What’s missing in the draft outcome document being negotiated for the UN's High Level Meeting on Tuberculosis? Countries need to commit to national-level targets in the draft declaration, not just global cumulative goals. National targets for testing, treatment, and prevention coverage are essential for scaling-up the response. The declaration needs to include strong language around access to medicines that re-affirms the rights of countries to use TRIPS flexibilities and other safeguards to protect public health. These rights were laid out in the WTO Declaration on the TRIPS agreement and public health in 2001, and have been further clarified and re-affirmed in the outcomes documents following the UN High-Level Meeting (HLM) on HIV in 2011 and the UN HLM on NCDs in 2011, the Sustainable Developments Goals (SDG3), and 3 weeks ago at the World Health Assembly. The best chance we have of ensuring access to new medical tools is to build in equitable access principles and practices into how research and development is financed and conducted. Governments need to recognize that TB R&D is a shared responsibility and they need to ensure that the products of government-funded research are affordable and accessible, including by delinking the cost of R&D from the final price. There is a precedent: such language was part of the political declaration of the 2016 UN HLM on anti-microbial resistance. While similar strong language appeared in the first draft of the TB outcomes document, some governments are now actively trying to remove it. Governments need to include financial targets for TB programs and to support TB R&D to develop the new tools and technologies to prevent, diagnose and treat TB. What happens after TB gets its day at the UN? Either we slide back into mediocrity, lack of transparency and accountability, or we hold governments to account for the commitments they made. This will depend largely on whether there will be regular reporting on progress, or the lack there of, an accountability body such as a Global TB Leaders Taskforce, and a follow-up HLM in meeting in 2023. Member states are resistant to some of these suggestions from the TB community. Every year, there are approximately 1,600 cases of tuberculosis in Canada alone. Supporting new treatment regimes for TB would benefit patients in Canada and millions of others around the world, including in MSF’s programs. Getting there requires a new approach for developing new TB treatments, and it is clear that the current model of research and development is not meeting the public health needs for TB — only two new compounds for for drug-resistant TB have been registered in the last 50 years and only seven are currently in clinical development. That’s why in October 2017, MSF told the Standing Committee on Health how Canada can Step Up and support the development of new TB regimens that are short and affordable for patients who need them through a new mechanism we’re supporting called The Life Prize. MSF is also using new six-month treatment combinations of TB medicines in our TB-PRACTECAL clinical trial to find a new treatment regimen for drug-resistant TB that is better than what is currently available. We launched TB-PRACTECAL because we treat more than 20,000 people with TB each year and we felt compelled to search for new improved treatments ourselves, and because too few pharmaceutical companies and other organizations were doing enough about it. We can’t do this alone – we need governments like Canada to #StepUpforTB and help support a pipeline of new drugs to find new, better treatments for TB that are shorter, more effective, and more affordable. One-third of the world’s population is currently infected with the TB bacillus – but, with a latent form of the disease, have no symptoms and cannot transmit it. In some people, the latent TB infection progresses to acute TB, often due to a weak immune system. Of the 10.4 million new cases of TB in 2015, 5.9 million (56%) were men, 3.5 million (34%) were women and 1.0 million (10%) were children.Every year, about nine million people develop active TB and 1.5 million die from it. Transmission: TB is caused by bacteria (Mycobacterium tuberculosis) that are spread through the air when infected people cough or sneeze. While anyone can be infected with TB, people with weakened immune systems are at particular risk of developing active TB. People living with HIV are more likely to develop active TB and accounted for 1.2 million (11%) of all new TB cases in 2015. Signs and symptoms: Most people exposed to TB never develop symptoms, since the bacteria can live in an inactive form in the body. The disease most often affects the lungs. Symptoms include a persistent cough, fever, weight loss, chest pain and breathlessness in the lead-up to death. Diagnosis: In countries where TB is most prevalent, diagnosis depends largely on the microscopic examination of sputum, or lung fluid, for the TB bacilli. The test is only accurate half of the time, even less so for patients who also have HIV. Treatment: A course of treatment for uncomplicated TB takes six months. Treatment for multidrug-resistant TB (MDR-TB) is especially arduous, taking up to two years and causing many side effects. When patients show resistance to MDR-TB drugs, they are considered to have extensively drug-resistant TB (XDR-TB) and have even fewer treatment options. Doctors Without Borders has been fighting TB for over 30 years. We provide treatment for the disease in many different contexts, from chronic conflict situations, such as Sudan, to vulnerable patients in stable settings such as Uzbekistan, southern Africa and the Russian Federation. Doctors Without Borders has TB treatment projects in 24 countries around the world, and in 2015 supported more than 20,000 TB patients on treatment, including 2,000 patients with DR-TB. Two new drugs – bedaquiline and delamanid – have recently become available to some patients who have no other treatment options left. MSF and other treatment providers are showing that stronger TB regimens containing one of the new TB drugs along with ‘repurposed’ drugs (not specifically developed for TB but that have shown efficacy in treating it) can significantly improve the health of people with MDR-TB. As of October 2016, Doctors Without Borders has initiated more than 1,000 patients on bedaquiline and/or delamanid in 12 countries. Programmatic data has shown promising early results on the effectiveness of these regimens, while patients report that the toxic side effects of treatment are reduced. It is also hoped that using the two new drugs in combination will be particularly effective in treating patients with the most severe forms of drug-resistant TB. In Doctors Without Borders projects in Armenia, Belarus, India, Mozambique, South Africa, and Swaziland, medical teams are already piloting the combination of the two new drugs as part of the regimen for patients with very limited treatment options. Doctors Without Borders is involved in two TB clinical trials – TB PRACTECAL and as part of the endTB partnership – to find new, shorter, more effective combination treatments for multi-drug resistant TB that include the new drugs. Patients’ needs are at the heart of both trials, which aim to find treatments that contain no injectable drugs and have manageable side effects. Both trials are expected to enrol the first patients by the end of 2016. Globally, there is still an unacceptable gap between those who would benefit from these new drugs and those who are able to access them. As of October 2016, only 5,738 patients have been able to access bedaquiline globally through programmatic use (i.e. outside clinical trials) or compassionate use, the majority of them in South Africa. There is an urgent need to increase people’s access to these more effective treatments by making them affordable and available.